The completion of the Ring Rail Line in 2015 means a fundamental change to bus routes in Vantaa. HSL is preparing route network plans to accommodate the future rail link. The Ring Rail Line will connect the main line to the Vantaankoski line via the Airport. It will bring rail services to new areas in Vantaa and improve public transport connections in the entire Helsinki region. Train will take passengers from the center of Helsinki to the Airport in 30 minutes, and long-distance train passengers from the north can conveniently change trains at Tikkurila station to get to the Airport. 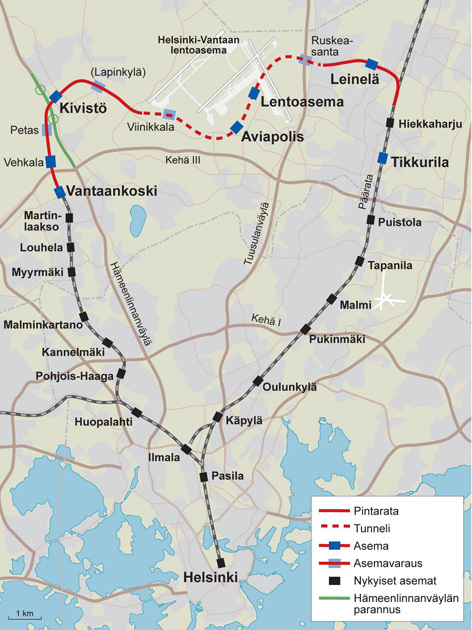 HSL and VR have launched the planning of train services on the Ring Rail Line and Kerava City Rail Link. The planning includes, for example, determining the service frequency and operating hours as well as deciding at which stations the trains will stop. When the new rail link opens, the entire bus route network in Vantaa will be reorganized. The reorganization involves route network plans for four areas: Aviapolis, West Vantaa, Korso-Koivukylä and Tikkurila-Hakunila. During the preparation phase, HSL has collected ideas and comments from residents via online forums established for each plan area. The total length of the new rail line will be 18 km, of which 8 km will run underground. Services on the Ring Rail Line will be operated with low-floor trains Sm5 or so called Flirt trains. Initially, there will be Park & Ride parking places for some 700 cars and 840 bicycles. There will be surface stations at Kivistö and Leinelä and tunnel stations at Aviapolis and the Airport. In addition, Vehkala station will be completed already in the first phase. Plans allow for additional stations at Petas, Viinikkala and Ruskeasanta. The Ring Rail Line is a joint project of the Finnish Transport Agency, City of Vantaa and Finavia Oyj. The total costs of the project are EUR 655 million.